I’m with a group of friends and family and we are in a striped marquee. It’s the Edinburgh International Book Festival and I’m feeling sick with apprehension. 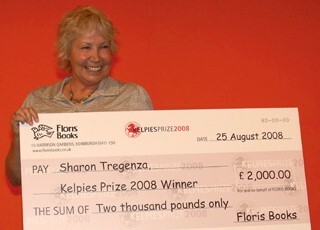 Weeks earlier I’d had a letter from Floris Books to tell me that my submission was short-listed for the Kelpies Award. At stake is a cheque for £2,000 and a guaranteed publishing contract for my children’s book. I practised my Oscar-winning “Thank you all so much” smile in front of the mirror, painted my toenails, and bought a new outfit. Then all I could do was wait. Now, we three short-listed writers make polite conversation, pose for photographs and nervously sip wine. The tent is full – buzzing with local media, writers, publishers, and agents as well our supporters. There’s a call to order and I hurry back to my group to take the good or the bad news surrounded by people who care. The crowd grows quiet and I can feel my heart hammering. Annmarie Allan gives a gracious speech about her year as the previous Kelpie winner and then Viv French takes the stage. She reads excerpts from all three books – mine is last. I listen hard to the others over the deafening sound of blood thumping in my ears. God, that’s good, I think. Is it better than mine? Is it? She’s reading my story now – my characters, my setting, my book. Viv reads brilliantly and I hear the children, who have lived for so long in my imagination, come to life. It’s a thrilling moment. The readings are over. I can feel the tension in the air as the envelope with the Winner’s name is passed on stage. The next few seconds feel like hours as I hold my breath for that X-Factor moment. 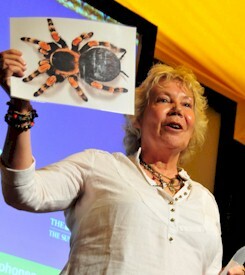 "And the winner is ... Tarantula Tide by Sharon Tregenza." My family explodes with shrieks and cheers as I fight my way through to collect my super-size cheque and face a barrage of flashing cameras. I am gloriously happy. My smile is a mile wide and is reflected back by the sea of faces below me. We party into the small hours, recounting each wonderful moment. Every twenty minutes or so someone shouts out ... "and the winner is?" And we all scream back: "Tarantula Tide by Sharon Tregenza." The honeymoon is the shortest ever and I meet Gale, the editor, at the Floris Books office first thing the next morning to start the editing. I haven’t had time to panic. I’m still euphoric (and slightly hungover) from the night before but I’d managed to get up early and was in the office almost before they were. I’m shown the book cover for the first time. The striking black, white and red design, that seems so familiar now, knocks my socks off. I love it. I had vague thoughts of just how my book would look from the minute I was short-listed – but this is better, far better than I imagined. I detect a sigh of relief all round. With a cup of coffee in hand I sit with Gale to go through the editing on computer. Floris has already done a great job with the manuscript and the editing is far less painful than I expected – enjoyable really. There’s little we disagree on and I know I have a few days to get home and go through the details again on my own. Everyone at Floris is friendly and the atmosphere jovial as they tell me how difficult it was not to give anything away at the ceremony the night before. Christian and I go over the details of the contract and I’m thinking, well, lookee here at me signing my book contract. I don’t think I’d stopped grinning since the announcement the night before. Back home, in my study in West Wales, I have time to consider and implement the changes needed. There is no drastic revision and the bits I add fit easily into the story – enhance it even. A couple of emails back and forth to Gale and within a few days we’re done. My characters, my story, my setting, are out of my hands. The next time I see it, Tarantula Tide will be a fully-fledged book. The launch night arrives along with the worst thunderstorm I’ve seen in ages. Two intrepid girls from Floris Books fly from Edinburgh to Cardiff and drive straight to my home on the Pembrokeshire border. Now, they form part of a small procession of cars that’s crawling through buffeting winds and angry Welsh rain to Trinity University in Carmarthen. Trinity is where I took my MA and they’ve kindly co-organised the event and offered the use of a room in the Halliwell Centre for the launch. I knew it was a lovely room but it’s a big room. I worry that no one, apart from my loyal band, will be crazy enough to brave the storm for a book launch. I have visions of my words echoing in the emptiness and of selling only one or two books. The girls from Floris have travelled such a long way. We’re drenched to the skin the minute we leave the car but once inside – things improve. 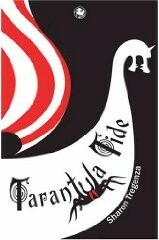 The books have arrived and we quickly arrange posters and copies of Tarantula Tide around the room. Floris have supplied wine, fruit juice and snacks to eat. Trinity have done us proud with tables neatly stacked with shining glasses and white napkins. They’ve even supplied a “man” – a great character who offers help and immediately goes into an angry tirade of reasons why he can’t help, when we accept. "Shall I arrange some chairs for you?" "That’s all very well but I’ve got a all these glasses to polish and napkins to fold and ..."
"Do you want me to pour some wine?" "You’ll have to do that yourselves. I’ve got enough on my plate. I’ve got to find bowls for the crisps, get another tablecloth ..." He’ll appear in one of my books one day. We busy ourselves as the room quietly fills. I’m nervous, but the reading from my book goes well and everywhere I look friendly faces encourage me with nods and smiles. By the time I’ve reached the last paragraph I’m enjoying all the attention – a monster is born. The signing is even more fun – queues of people waiting for my book. We sold loads. Driving home through the storm I didn’t care about the rain or the wind or the thunder and lightening. I only cared that my launch had been a success and I was now a "real" writer. Sharon Tregenza is a children’s author who has published over four hundred stories, articles and poems worldwide. Her first mystery/adventure novel for children, Tarantula Tide, won the Kelpies Award and is short-listed for the Heart of Hawick children’s book award 2010. Tarantula Tide: Smugglers. Vikings. Shetland should be fascinating place for a holiday, but Jack is harbouring a secret and is less than enthusiastic to be there. Then he meets Izzie and her exotic pets and things get a lot more interesting: Jack finds an unexpected visitor underneath the fridge; the wandering man is not what he seems, and each night a mysterious person waits on the beach outside Jack's cottage. But what do all these have to do with an unusual visitor named Octavia? Jack and Izzie find themselves in the middle of a dangerous adventure, wondering what the next tide will bring to the land of the Viking Fire Festival. "From the ancient brochs, to the gorgeous wild ponies, to the enormous skuas, the raw splendor of the Shetland Islands comes alive in this mystery. Tregenza brilliantly harnesses the charm of wonder of this magical setting and wraps it around an exciting adventure. Young readers will be easily drawn into solving the puzzle with Jack and Izzie.’" Midwest Books – United States. Short stories with an animal as the central character are sought for an anthology from Bridge House in support of the Born Free foundation. Stories should be aimed at adults and be between 2,000 and 8,000 words long. The deadline for submissions is November 30, 2009. Kasma Magazine is seeking short science fiction stories from new and established writers worldwide.